After annexing Austria and the German-speaking portion of Czechoslovakia, Hitler decided to expel Jews living in Germany who were born in Poland. On October 27-8, 1938, 18,000 Jews were put on trains bound for the Polish border. Some were forced to enter Poland by the Nazis while some camped in a tiny Polish village. Zindel sent a postcard to his son Hirsch who was studying in Paris. Mad with rage, he went to the German Embassy in Paris and shot the first German official that he met, Ernest vom Rath. Ironically vom Rath was not a Nazi. Hitler and the Nazis called the murder a Jewish conspiracy against Germany. In fact it was a convenient excuse to do what Hitler had wanted all along: to expel all the Jews from Germany. Eager to carry out Hitler’s orders, the Nazis decided on a plan of action which they put into place on November 9, 1938. Their plan is now known as Kristallnacht – the night of broken glass. On that night, Stormtroops and Nazi party members burned synagogues, destroyed Jewish shops, and beat up as many Jews as possible. Bonfires were lit to burn prayer books and Torah scrolls. In 24 hours 91 Jews were killed. Over 30,000 were arrested and sent to concentration camps. 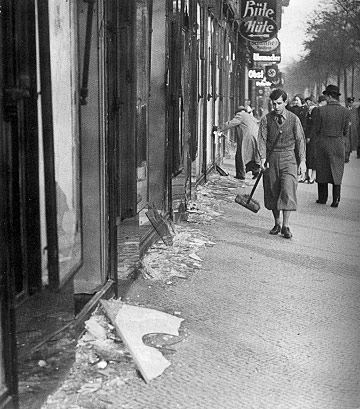 After Kristallnacht Jews were fined 1 billion Reichsmarks for vom Rath’s death. Jews were also fined for the destruction of their own property. The Nazis were systematically pushing Jews out of the German economy. As of January 1, 1939, Jews could only be employed by other Jewish organizations. These conditions led to attempts of many Jews to emigrate to other countries such as the United States. The question was whether or not the other countries would welcome the Jews.